What if I told you I have hundreds — make that thousands — of people who are interested in your industry and willing to meet you in person? They are eager to learn more and open to making purchases. It’s not too good to be true; it’s just a good old-fashioned trade show. The benefits of trade shows include brand exposure, gaining sales leads, staying on top of market trends, and so much more. If you’re ready to explore the trade show experience, here are our five steps to exhibiting successfully. The first step is to decide what your goals are. Have you recently released a new product or service? Do you need to generate buzz about an upcoming campaign? Now’s the time to strategize and nail down your budget. Spread the word about your booth to your existing and potential clients with marketing materials such as mailers or emails. Be sure to include your booth number and a call to action that can be fulfilled at the show. Social media is another great tool for promoting your booth; plus, it’s your introduction to the trade show community. Take the time to set up meetings with any new contacts, potential connections, and existing clients. Don’t forget to use the event hashtag! After you’ve taken care of your own marketing materials, find other avenues where you can advertise. Can you sponsor the show or a show event? Can you promote your business in the show materials, e.g. their program or flyers? Be sure to keep all your materials before, during, and after the show consistently branded so there’s no confusion. Step 3 – Create a killer booth. First, focus on the design. Plan for your booth’s location — if you can pay more for a great spot, do it! 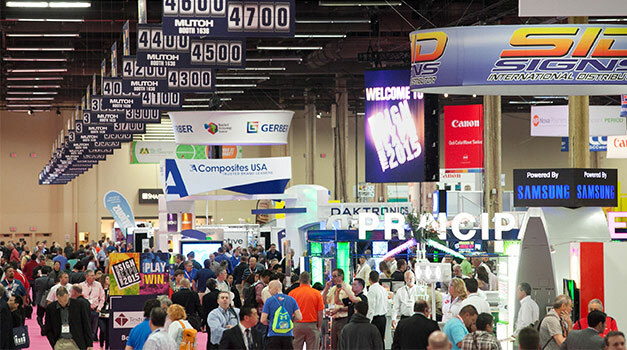 Adapt your graphics so that people in different locations can recognize your booth. The goal is to attract attention from afar, draw people into the booth, and engage them while they’re there. Next, use your imagination! Can you incorporate video and interactive technologies, non-traditional lighting, the booth floor, or the overhead space? Take advantage of the space you have. Showcase your products and services with demos and samples, and if possible, test your booth materials prior to the show. Finally, bring great representatives. Trade shows are all about making connections and sharing information. The people who represent your company should be well versed in what you have to offer, and they should be genuinely excited to meet new people. A trade show isn’t just standing in your booth for eight hours. Get out there and network with other people in your industry. Learn about your competitors, take note of trends, and attend seminars or learning experiences that are offered. Even better — register to present a seminar of your own and show off what you can do. Step 5 – Follow up. Don’t let the effort you put in go to waste by neglecting to follow up. At the show, offer takeaway items — giveaways, swag, business cards — so attendees will remember you later. Solidify the connections you made with follow-up emails and calls. Don’t forget to measure your activities! Track response to your follow-up and take note of what piqued most attendees’ interest. Finally, share pics, stories, and thoughts on social media so that your clients who weren’t able to attend can stay in the know. You’re officially ready. Get out there and enjoy the show!